Moon Geun-Young prepares to take some Innocent Steps. The Skinny: A somewhat by-the-numbers romantic comedy that equals more than the sum of its parts thanks to the performances of its two lead actors - in particular My Little Bride's adorable Moon Geun-Young. The film takes a strange dark turn in the final act, but overall, it should be a charming cinematic experience for people with a soft spot for romances. 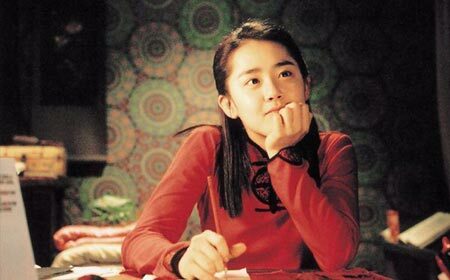 Review by Calvin McMillin: Moon Geun-Young, star of the hit romantic comedy My Little Bride, takes the lead role in Innocent Steps, a charming, although not wholly satisfying romantic comedy from director Park Young-Hun. The teen idol plays Jang Chae-Rin, an ethnic Korean living in China, who finds herself to be a complete fish out of water after being transplanted abroad to South Korea. When her sister bows out of a dummy marriage to a champion dance instructor, Chae-Rin decides to travel to Seoul herself and impersonate her sister. Once in South Korea, she meets Na Young-Sae (Park Geon-Hyeong), who has agreed to the sham marriage for the sole purpose of locating a new dance partner. It seems he's looking to replace the one he lost to his rival, the dastardly Jeong Hyeon-Su (Yoon Chan). But when Chae-Rin's secret and her lack of dancing experience is revealed, Young-Sae wants to send his new bride back. Eventually, however, he has second thoughts and decides that his only hope is to train this wide-eyed novice himself. Of course, the practices start off as purely professional, but as Chae-Rin begins to dedicate herself to the art of dancing, a connection between the newlyweds begins to take shape. Chae-Rin's youthful exuberance and folksy way of speaking eventually charms Young-Sae's hardened heart. There's even an amusing subplot about two immigration officers seeking to expose the couple's secret, while eventually rooting for the two to stay together. However, all that funny business comes to a close about an hour into the proceedings. Oddly enough, things take a dark turn in the film's final act when Young-Sae's old nemesis returns to turn his world upside down. It turns out that things aren't quite what they seem. As a result, the couple gets broken apart, and Young-Sae suffers a devastating loss. Can their possibly be a happy ending for these two? Well, yes. Innocent Steps is a kind of romantic comedy after all. However, the lack of a more traditional rousing ending makes the film a mixed bag to say the last. Although it may seem strange to suggest it, this is the one case in which the story would have benefited from actually sticking with genre conventions. From the very beginning, the type of relationships and conflicts depicted in the film seem to fall in line with typical romantic conventions. It's commendable that the filmmakers decided to break from tradition toward the story's end, but it's also important to realize that formulas work for a reason, and for Innocent Steps to depart from that tried-and-true method after an hour of fantastic build-up ends up subverting expectations in a way that the audience will neither understand nor appreciate. It just doesn't make sense for a film that is so clearly a romantic fantasy to suddenly become gritty and realistic. Who wants to see a romance in which bad deeds go unpunished, and the good people must simply make do with their circumstances? Even if love prevails, it does not conquer all. And thus, what you have in the end is something that's a comedy in neither the contemporary nor Shakespearean sense.